When the Milwaukee Brewers embarked on a large-scale rebuilding program in 2015, the expectation was that it would take four or five years to return to competitiveness. That’s the way it went with other rebuilding clubs, such as the Chicago Cubs and Houston Astros, but the Brewers somehow got it done in a mere three years. It certainly didn’t hurt when star outfielders Christian Yelich and Lorenzo Cain were added to the team on Jan. 25, 2018, a sign that management was all in. The 2018 Brewers caught fire at exactly the right time, reeling off eight victories in a row to end the season. Included in that incredible run was the Game No. 163 showdown in Wrigley Field, when the runaway Brewers wrestled the division crown from the Cubs in dramatic fashion. The Brewers stretched their winning streak to 12 games by sweeping Colorado in the NLDS and winning Game 1 against the Dodgers in the NLCS. The underdog Brewers, playing with a payroll about half that of LA, stretched the series to seven games before bowing, falling just short of the franchise’s first World Series since 1982. But the ’18 Brewers captured the imagination of fans in Milwaukee and across Wisconsin, creating a buzz not heard for decades. An impressive 2.85 million fans went through the turnstiles of Miller Park, a remarkable showing for MLB’s smallest market. Special Brew is an inside look at the decisions, the decision makers and the players who made it all happen, some who were expected to excel, others who seemingly came out of the blue. 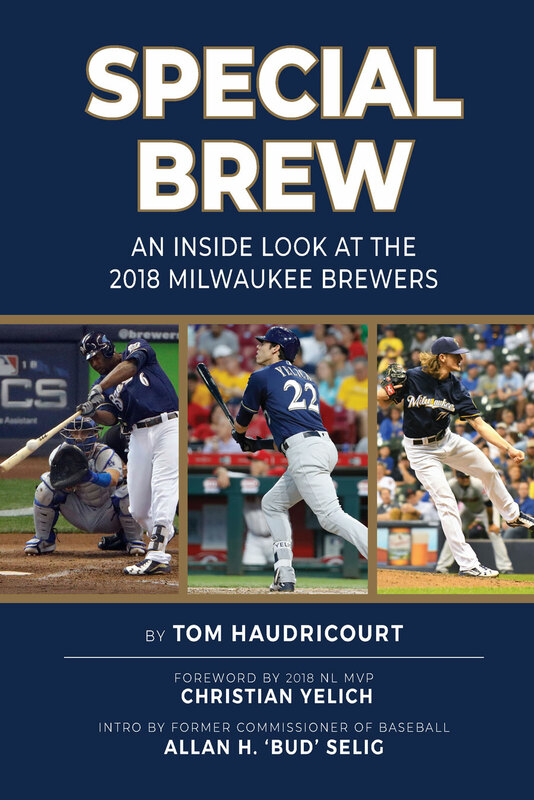 Being there on a daily basis as a beat writer for the Milwaukee Journal Sentinel, author Tom Haudricourt pulls back the curtain and provides fans with an up close-up look at the inner workings of this remarkable season.